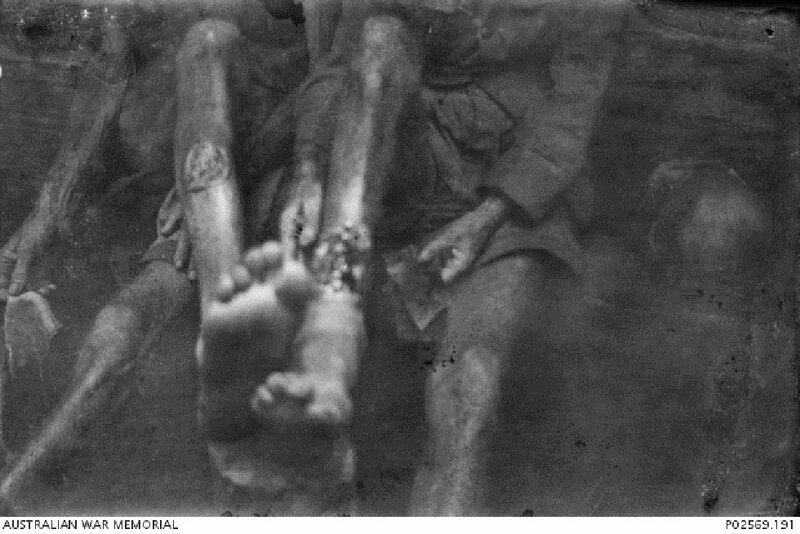 Tropical ulcers forming on the lower legs of two unidentified members of "F Force" on the Burma-Siam Railway. Due to lack of medical supplies, many POWs working on the railway would have to have their limbs amputated without anaesthetic, 1943. Image courtesy of George Aspinall, Australian War Memorial. Between 1 March 1943 and 31 March 1944. Between 19 February 1943 and 1 March 1943. Between 1 April 1944 and 15 August 1945. In or about August 1944. Between 4 May 1943 and 12 June 1945. In January 1943, 500 POWs left Singapore for New Britain. Enroute, the ship they were travelling on was torpedoed. The surviving POWs completed the journey in circumstances of great privation. The POWs arrived at Rabaul, New Britain on 19 February 1943 in an extremely weakened state. Despite their condition, the POWs were made to work only after a brief rest of 24 hours. Many foot injuries were sustained owing to the absence of footwear. The accommodation was also said to be insufficient and unsanitary. Subsequently, the POWs were transferred to Tanoura on 1 March 1943. Again, conditions were miserable. It was said that the accommodation were unhygienic, there were insufficient blankets and clothes, there were no medical supplies and rations were inadequate. Furthermore, sick men were forced to go on fatigue duties, resulting in deaths and more illness. Certain medical procedures were conducted on the POWs. It was said that these were unorthodox and unnecessary methods of treating tropical ulcers. As a result, several amputees contracted gangrene and died subsequently. This case raises questions about trial organisation and administration of sentences. The 5th accused had served out his sentence and was released before confirmation. The 1st accused was sent to another trial location to give testimony and had not yet returned to Singapore when trial documentation was being finalised. As a result promulgation had to be delayed. 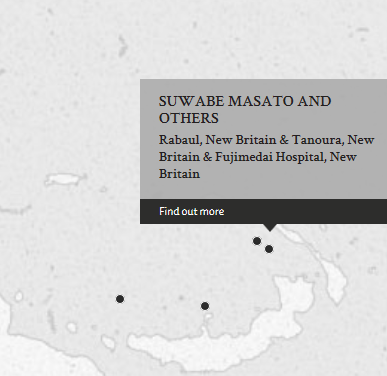 Suwabe, Masato. Colonel. From Japanese military. From Japan. Guilty. Guilty. 9 months' imprisonment. Sentence confirmed but not promulgated - he was trasferred to Rabaul to give evidence at a war crimes trial and had not been returned as of promulgation date. Shimotsuura, Hirose. Captain. From Japanese military. From Japan. Guilty. 1 year imprisonment. Sentence confirmed. Numata, Kimio. Medical Captain. From Japanese military. From Japan. Not guilty. Nakagawa, Koichi. Medical Captain. From Japanese military. From Japan. Not guilty. Moto, Tomizo. Sergeant. From Japanese military. From Japan. Guilty. 3 months' imprisonment. Sentence not confirmed - his sentence had terminated and he was released from Changi Gaol under authority GHQ SEALF to a JSP camp for subsequent repatriation to Japan before his sentence was confirmed on 2 May 1947. Ogura, Seijiro. Corporal. From Japanese military. From Japan. 6 months' imprisonment. Sentence confirmed. Forsythe, P.A. (Military Medal). Lieutenant Colonel. From British military. Court President. Dennis, A.E. Captain. From British military. Ward, F.W. Major. From British military. L.L.B. Lead Counsel. Osaki, Koshi. From Japan. LL.B., Barrister-at-Law, Judge, High Court Tokyo. Lead Counsel. Phillips, A. Captain. From British military.